For 114 years National Jewish Health has been the leading respiratory hospital in the nation and conducts innovative groundbreaking research to improve health worldwide. Our mission since 1899 is to heal, discover, and educate as a preeminent healthcare institution. We specialize in respiratory, cardiac, and immunological diseases and have become the best in the world in research and treatment. 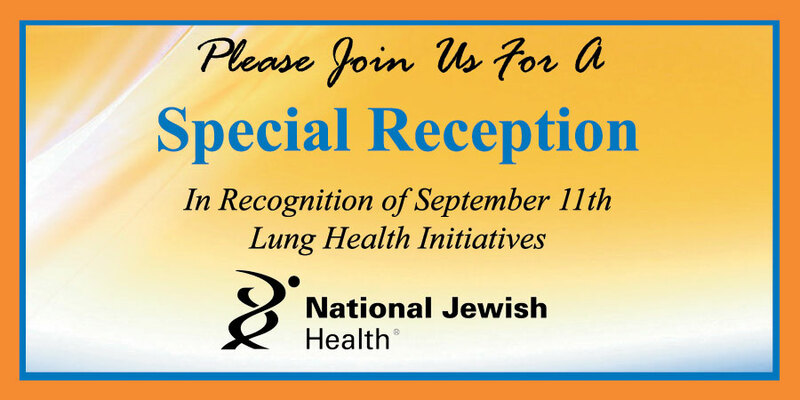 The reception will raise awareness for lung health initiatives that include special recognition of the respiratory diseases our nation’s first responders have acquired while on the job. National Jewish Health’s expert Department of Environmental and Occupational Health Sciences has screened 9/11 works in our clinics and firefighters who have inhaled toxic fumes. National Jewish Health is the only institution in the country devoted solely to care for these types of specialized respiratory illnesses.